Bauer has been at the head of hockey innovation for over 75 years. Always committed to growing the game, first on the ice, and now on street and dekhockey surfaces. Bauer offers a full line of dekhockey gear for players and goalies. Designed by Athletes, for Athletes, made in the USA. Out mission is to put our 35+ years of experience, exclusive procedures and extensive technical knowledge to work for you. As the designer, manufacturer and installer, we have complete quality control over our products and the ability to focus research and development. 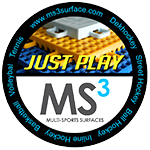 Whether you are playing indoors or out, on a small residential court or in front of thousands on the national stage, MS3 products insure maximum playability, lasting durability and a safe, responsive playing surface. We work hard to provide the best surface possible, allowing you to focus on the sport.